The Environmental Protection Agency (EPA) and State National Pollutant Discharge and Elimination System (NPDES) Authorities (IDEM in Indiana) encourage MS4s to conduct regular inspection and maintenance evaluations of Municipal storage areas to reduce pollutants discharged to separate storm sewers. Download this blank, sample checklist to aid in your evaluation process. MS4 operators, coordinators, and employees who participated in our annual training webinar received a blank, sample self-inspection form. This webinar seeks to satisfy EPA and State NPDES Authority requirements for MS4 employee training. 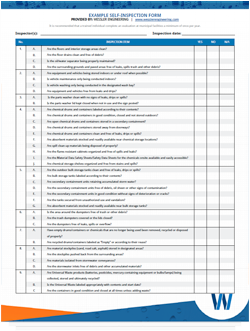 Complete the form to download and print this blank checklist and completed example to aid in your evaluation process.